The Youngest and the Oldest. Today, my Dad’s youngest sister came to visit – to see her only surviving brother after his short stay in hospital last week. I am not allowed to call her Aunty Rae because she is only seven years old than me; she is 18 years his junior and he really is her “big brother”. We talked about family, places and people we have known or not. Rae had to remind my Dad that she will never remember living in Elvire Street in Midland – because she hadn’t even been born then! 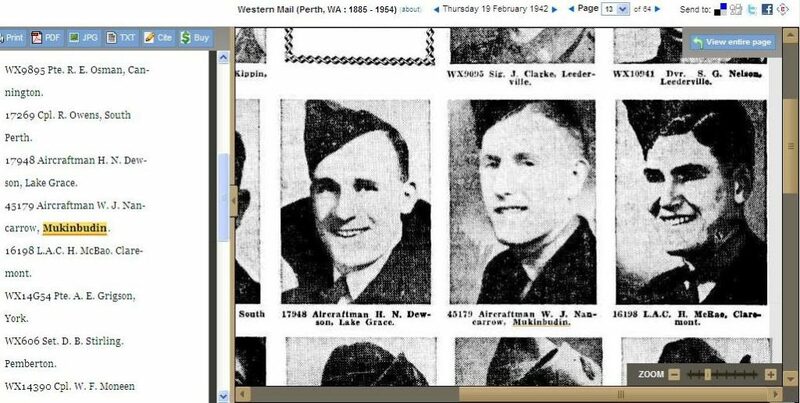 My Dad (William James Nancarrow aka “Blue”) was born on 26 March 1918 at Nurse Lloyd’s Private Hospital in Coolgardie Street, Subiaco and an online search this afternoon at National Library of Australia – Digital Newspapers found a copies of notices posted in the three major newspapers of the day. Rae, his youngest sister, was born in January 1936 and she is the last of my Dad’s eleven brothers and sisters born to Nana (Ivy) and Pop (William George) Nancarrow, who were married on September 17, 1917 in Mullewa. Rae was born at K.E.M.H in Subiaco; my Nana made the journey from Mukinbudin for the confinement and birth. In April, 1936 aged barely 18, Dad was awarded a trophy for his cycling exploits in Mukinbudin – along with his friend Jimmy Stewart and in 1937 after his 19th birthday, he left when Rae was just over one year old to go to work in Caron to work on Reid’s farm for a couple of months. 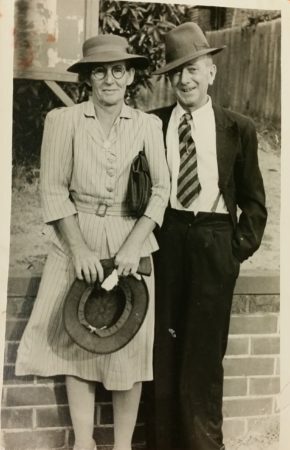 They helped him get a job with the Farrell family on their property at Perenjori; he spent a season there seeding and after a few months, my Dad went to Cue to live with his Grandma and Granddad Ridley. In Cue, he spent time prospecting and dry blowing for gold with Granddad Ridley but he says they didn’t strike it rich! His spare time was taken up with cycling, football (where he was written up in the local paper as “Nancarrow has shown some improvement over his usual game” and cricket (with a career highest score of 78 not out). In early 1938, he went to Beringarra Station to work for Mr & Mrs Wood, the station managers, as a station hand – and I smile when I think of my 15yo son, Colin, embarking on a similar career on Cherrabun Station in the Kimberley many years later. There is a difference though: my Dad went to work with the sheep side of farming on Beringarra while Colin dismisses them as “ground lice” and his work in the North West was fixing windmills and to help round up cattle that had been running wild for the previous year. I have never been to Beringarra Station and the closest I have been to Cherrabun was to find it on the map as a Greyhound bus sped me through the night from Kununurra to Broome – on the memorable day that St. Kilda and Collingwood drew in the AFL Grand Final. After a year on the station – much of it spent by himself camping out in the bush with only his horse, “Jimmy Boy” and his waterbag, with Mr. Wood coming by every couple of weeks with light supplies – Dad moved to Big Bell. Work was very scarce; hundreds of men were still unemployed as the depression was slowly receding and after three weeks of turning up every day outside the mine office along with other men, he was lucky enough to be selected – but not only because he was a skilled metalworker. His sporting ability was a key part of him getting his job – because the mine management was keen to see the Big Bell Football Team strengthened and go up against Cue, Reedys and Mt Magnet. In 1941, my Dad enlisted in the RAAF while still working in Big Bell; married my mother and left to go to Adelaide. It was a short honeymoon: they were married at 5:00pm on Friday in St. George’s Cathedral and Dad left on a troop train from Perth Central Station at 12:00noon the next day. 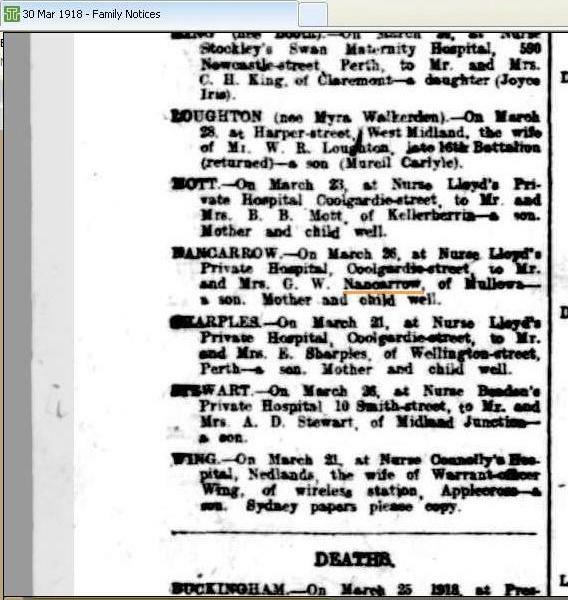 My Nana, Nana Nancarrow, came down from Mukinbudin with Rae – then a little girl of five – to see him off. 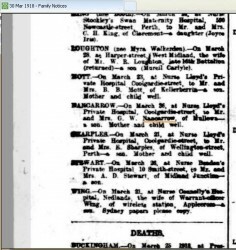 Nana went back Mukinbudin and my Mum went to stay with her own sister, Marian until she could sail to Adelaide under full wartime conditions, to be my Dad’s wife. 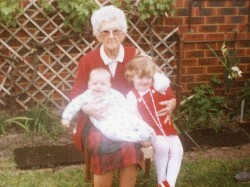 Marian is now 99, my Mum is 90 and they are the only surviving children of their own family. Tomorrow – I will tell you how, 30 years later in 1971, my Aunty Rae and my Nana Nancarrow were involved in a critical part of my life and that of my children – something that I only discovered today – 41 years after the event itself. Like Dr Who, we keep bumping into our future as we live each day, but without a sonic screwdriver, we neither recognise it nor change it,. Over 70 years, I can see Life’s Amazing Family Circle at work. I just love the way that life actually lets us tie up all the loose ends – if we will only listen. Instead of having a tangled web of discordant memories and perceptions – there is a great deal of unseen order in our lives. The trouble is, we are too impatient to wait for it to reveal itself, or too unbelieving. It’s not karma – but I am becoming more convinced that we can take charge of mapping out of lives for better results – if we just have more faith that all we need will be provided. We need that sonic screwdriver of trust!